Ferocious and destructive for those who trouble his devotees, Lord Vishnu in his incarnation as Nara-simha, the man-lion, nevertheless holds up here his right hand in a gesture of blessing, signifying that he is but benevolent for his devotees. 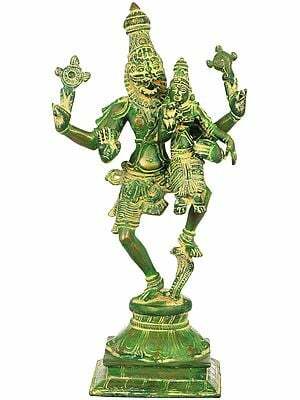 This tellingly rendered sculpture thus very effectively brings out both these qualities of the Supreme Lord Vishnu. 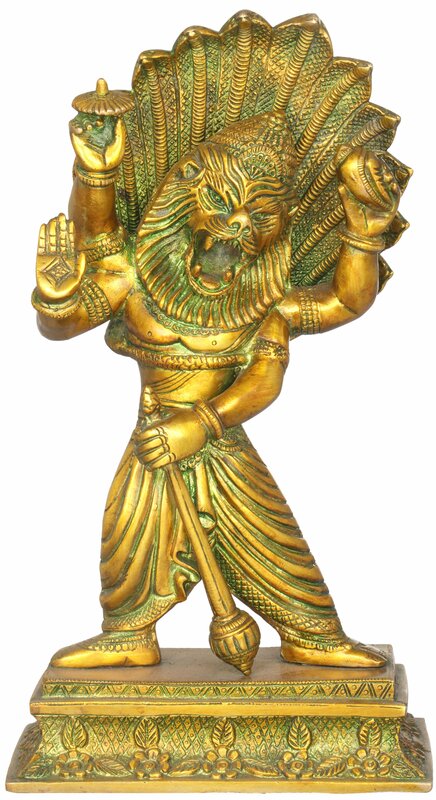 Energy pulsates through Narasimha's entire form. The maximum effect of the composition is situated in Narasimha's mouth, with a superby renderd mane, high nostrils, and the furrowing brow capped by a befittingly majestic crown. His lower limbs are covered by a traditional Indian dhoti, and he stands with the two legs pointing away from each other. A chakra, conch and mace adorn his three hands. An eleven-headed serpent with upraised hoods frames his face, adding to the sinister look of the sculpture. 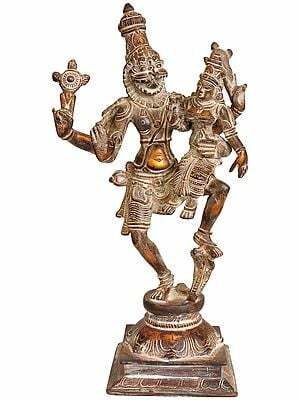 Vishnu's Narsimhavatara relates to Hiranyaksha's brother Hiranyakashipu who, annoyed with Vishnu for killing his brother Hiranyaksha in his Boar incarnation, had developed for him exceptional hatred. 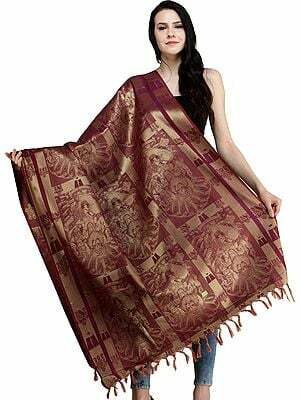 For obtaining such powers with which he could avenge his brother's killing he went to mount Mandara and engaged in penance. 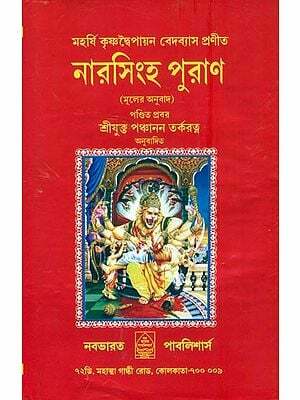 Pleased by his austerities Brahma appeared and commanded him to ask for whatever he wished. Hiranyakashipu asked for a number of things, but mainly that no one should ever be able to kill him. 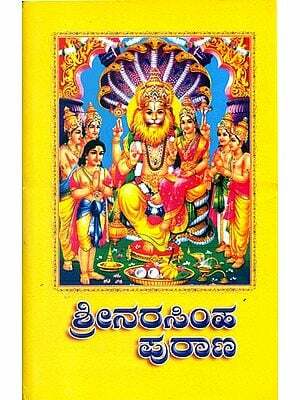 Brahma granted whatever he wished and also that he would not be killed by anyone but Vishnu. Some texts have added dramatic curves to this part of the episode. According to them, Hiranyakashipu asked Brahma that he should neither be killed by a god, demon, man nor animal, neither in day nor during the night, and neither inside the house nor outside it. 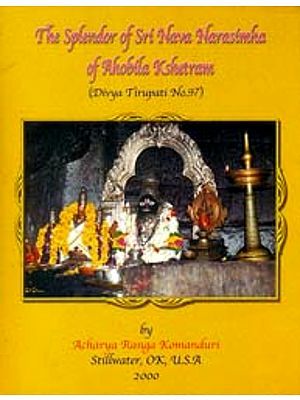 Brahma granted his prayer. Now invincible, Hiranyakashipu had his sway over the entire earth. Atrocious and cruel as he was, he proclaimed that no body in his dominions would commemorate Vishnu's name. In the due course he had a son by the name of Prahlad. 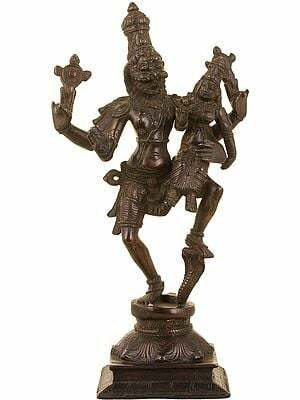 Prahlad was Vishnu's devotee by birth. It is said that the first word that he uttered was Vishnu. This greatly upset Hiranyakashipu. When Prahlad grew to age, he appointed a teacher to divert his mind from Vishnu but instead, Prahlad, the child, converted the teacher into a Vishnu's believer. The enraged Hiranyakashipu threw Prahlad before a mad elephant. The elephant charged at Prahlad but instead of hitting him elephant's tusks struck to the ground and broke. Venomous snakes were deployed to kill Prahlad but the moment a snake bit him its fangs were destroyed. Hiranyakashipu put him into blazing fire but the moment fire touched Prahlad's body it turned cool and soothing. According to one version, there rose out of the fire a ghost that attacked Prahlad to kill him but instantly there emerged in the air a wheel which beheaded the ghost. 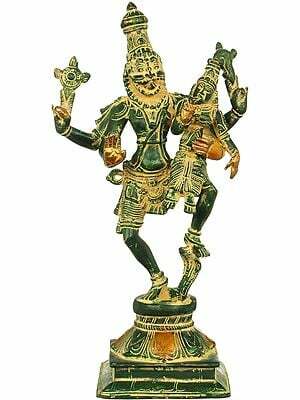 Burning with rage Hiranyakashipu cried and asked Prahlad where his Vishnu was. Prahlad coolly replied, "he is everywhere and in everything." Hiranyakashipu asked sarcastically if he was also in the doorjamb. Before Prahlad could say, "yes", the door-pillar burst and out of it emerged a horrible-looking Narsimha - half lion-half man. It was evening, neither the day nor the night and the place was neither inside the house nor outside it. 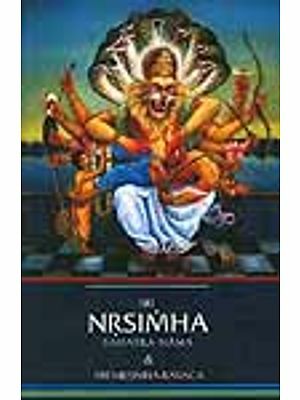 Narsimha caught hold of Hiranyakashipu, pushed him to ground and with its horrible claws tore his breast and killed him. This sculpture was made in the city of Aligarh, located in the state of Uttar Pradesh, central India, and the artist is Jassi.